Reyes, the worst burned victim in the Cedar Fire, has been recognized as a hero by the Smithsonian Institute for rescuing his parents, then running through a wall of flames. He spent a year in the hospital. While he acknowledges the role of the Mayor during the fires, as well as Councilmember Dale, he said serving four terms was enough. Reyes contended that Santee has “a good old boys network” that leads to stagnation. “I’m here to be the solution,” he said. He pushed for his signature issue—having Santee play a lead role in promoting solar energy, and stressed his opposition to the Quail Brush Power Plant. Acerra said that the people need to be represented in Council. She touted her experience organizing events for the San Diego Tea Party. She also said that she was elected in 2010 to the Republican Party Central Committee, and has been very busy in her district. http://www.meetup.com/thesandiegocountyteapartyforum/members/10075435/. 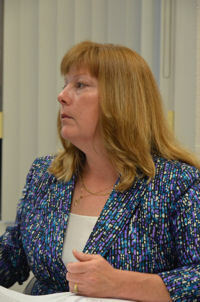 Acerra said the Council is not listening to the people, or the needs of business. Local business owners have also told her that Santee is full of red tape and not as business friendly as it once was. Business became a central issue of the debate, together with the budget and public safety. 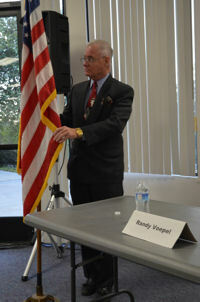 Both Voepel and Dale pushed how hard they have worked to bring businesses to Santee. These businesses range from large national chains to local companies. They noted that the Central part of the city, as well as the East have been revitalized. They expect to do that in the West as soon as the economy picks up. To both of them economic development is critical. To this effect Dale told the audience that Santee is in the midst of the largest infrastructure upgrade ever, in spite of the economic crisis. Roads and other city services help to attract businesses, he noted. In fact, both Voepel and Dale stated that they are working to attract either a Marriot or a Hyatt hotel. They indicated that Santee is doing better than most cities in our county. Acerra disagreed that the city was friendly. She accused City Hall of having all kinds of red tape and fees and licenses that made expansion difficult, if not impossible. She claimed she was here for the people and to bring business back to City Hall. A major point of contention was the arrival of the San Diego Christian College. As far as the Mayor was concerned, before the redevelopment funds went away, he saw it as a “lose-lose situation.” But now, he welcomes them. This will mean 2,000 students, plus faculty and staff. Dale agreed hat this was a good stimulus to the economy and Reyes agreed with both since education, no matter where it comes from, is a good thing. Acerra said that this “should have been put up to the voters.” She felt that a college may not be appropriate in a residential community. Dale also made a critical point. If he is re-elected, he is in line to become the next Chairman of SANDAG, which will allow him to help the city get better access to Federal funds. Reyes was clear that the statistics on minor crimes have indeed gone down, but that we need to take into account where the next wave will come from: heroin and methamphetamines. 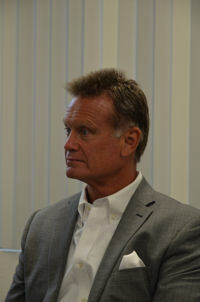 To this point Dale countered that Santee is ahead of the curve, establishing both a gang and drug task forces. Both Dale and Acerra agreed with the sentiment (if not the profanity). For Acerra since this is a family oriented community, medical marijuana clinics are not needed. 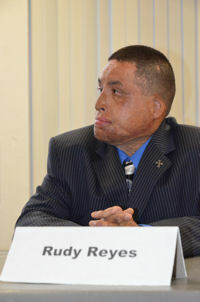 Reyes told the audience that he was recommended medical marijuana at UCSD after his serious burns over most of his body and has indicated that it provided pain relief during his recovery. He believes this is a medical issue, and noted that California voters agreed to this when they voted to legalize medical marijuana. Dale observed that while the voters might have approved it, multiple city attorneys keep reminding city leaders (not just Santee) that this is against federal law. The budget became a central issue. Both Dale and Voepel reminded the audience that the city was ready for lean times. They have cut down city staff by 20 percent and have not replaced any of that staff. The city is working well and ready to continue to work well, both maintained. Voepel also said that some Section-8 housing in the west part of town has been converted to commercial housing, however nobody was displaced. Due to the end of the redevelopment agencies, they will probably not build any more low-income housing in Santee, he made clear. On a mobile home rent control ordinance, Dale said “that’s the law of the land and that’s the law we’re going to enforce,” until it changes. 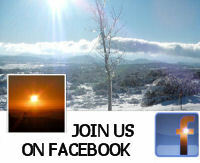 Acerra called for citizens to get more involved. Voepel said he wrote the ordinance and will “always stand with the residents” if the owners want to fight. Reyes said he lives on SSI disability and voiced empathy for low-income mobile home residents. On the sustainability issue, Reyes was adamant that we need to solarize roofs, and in that way we can actually create a network of local energy, and no longer be dependent on SDG&E. He gave the example of Germany that has left the U.S. in the dust with its adoption of policies that succeeded in incentivizing widespread adoption of solar, even though Germany has less sunshine than our region. Dale said that there are mandates coming from the state, and he does not like mandates, but the city will look for ways to comply and grow in a sustainable way. This was one reason the city joined the UN Sustainable Development organization, Paying experts would run into the $20,000 to $50,000 range, but this only runs the city $1200.